The numerical solution of fractional partial differential equations poses significant computational challenges in regard to efficiency as a result of the nonlocality of the fractional differential operators. In this work we consider the numerical solution of nonlinear space–time fractional reaction–diffusion equations integrated in time by fractional linear multistep formulas. The Newton step needed to advance in (fractional) time requires the solution of sequences of large and dense linear systems because of the fractional operators in space. A preconditioning updating strategy devised recently is adapted and the spectrum of the underlying operators is briefly analyzed. Because of the quasilinearity of the problem, each Jacobian matrix of the Newton equations can be written as the sum of a multilevel Toeplitz plus a diagonal matrix and produced exactly in the code. Numerical tests with a population dynamics problem show that the proposed approach is fast and reliable with respect to standard direct, unpreconditioned, multilevel circulant/Toeplitz and ILU preconditioned iterative solvers. We wish to thank two anonymous referees for their constructive comments which have improved the readability of the paper. 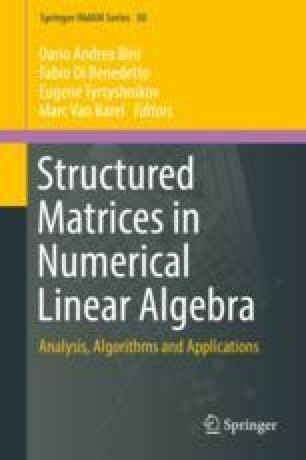 This work was supported in part by the 2018 GNCS–INDAM project “Tecniche innovative per problemi di algebra lineare.” The first author acknowledges the MIUR Excellence Department Project awarded to the Department of Mathematics, University of Rome Tor Vergata, CUP E83C18000100006.